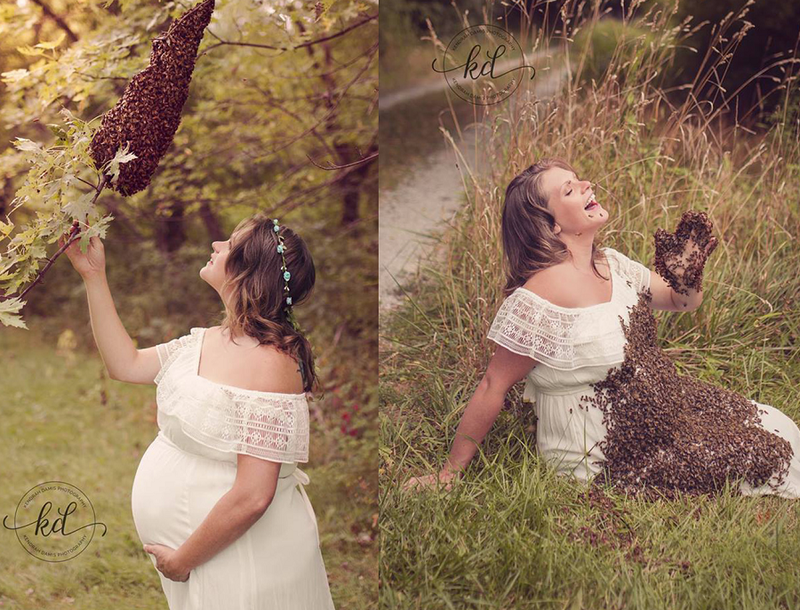 Her One-Of-A-Kind Maternity Shoot Has The Internet “BUZZING” With Laughter! Photographer Kendrah Damis had never had a request quite as exciting as this one, and the results have been shared hundreds of thousands of times – people can’t believe what they are seeing! Most maternity shoots are taken outdoors, with ethereal settings and flower crowns. Emily Mueller didn’t want all that…she wanted BEES! As a local beekeeper, Mueller has always had a fondness for bees! She works hard every day to rescue as many colonies as she can, and when she was planning to capture the last sweet moments of her pregnancy, she knew that posing with honeybees would be the perfect way to represent everything she loved all at once. Mueller knew about a swarm of honeybees that were looking for a new home and decided to include them in her pictures. To encourage the honeybees to swarm around her, she simply took the queen into her hand and the rest of the colony quickly followed. They were warm and happy to explore their new environment, and the unique nature of the pictures resonated with people within hours. The photographs have received mostly positive responses! Raising awareness about the sweet nature of the honeybee is exactly what Mueller was hoping for, and more people than ever have been interested in saving the honeybees! While it may be a little strange to contemplate, incorporating the things you love most – even if they are an entire swarm of bees – makes the pictures extra special!